My favourite crochet designer is Vita Apala. They are so original and stylish. When the Petal Collar Cardigan pattern was released I knew that I would make it for Blossom. I find Vita's patterns clearly written and fun to make. 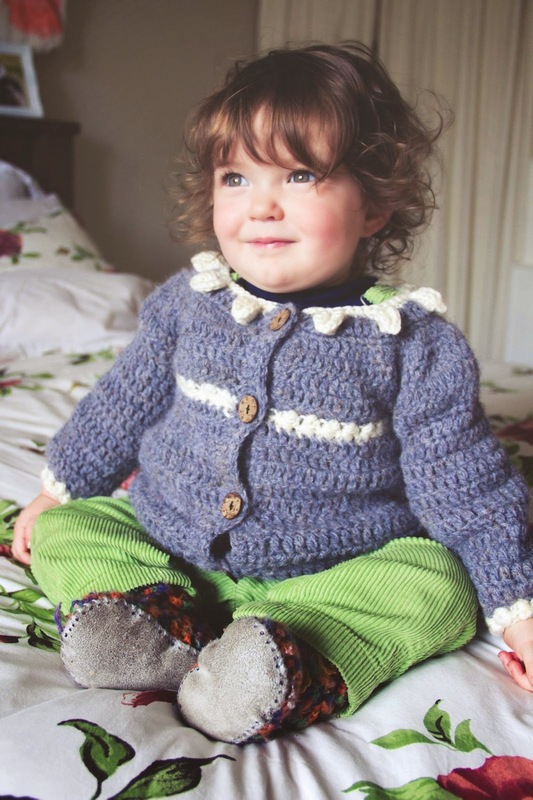 This cardigan is for the competition that is currently on the Mon Petit Violon website. I'm hoping that I will win 6 months of Vita's new patterns. I would love that. I was excited when I began making this cardigan. The last time I made Blossom a jacket was when she was a newborn. I got some lovely 100% wool yarn that I found in a thrift shop. It’ll be nice and warm for this winter. This is a vintage premium wool yarn, called 'Shepherd Taieri Plains'. A great find. I had a few practice runs when I started the cardigan, to get the sizing and stitch count correct. I needed to check my yarn would work for size. I worked from the 1-2 year size instructions. I made one row less for the yoke, because it seemed big enough. The grey wool yarn is very fuzzy so I used cream lambswool for the pattern details to get better stitch definition. The cardigan is very warm and cosy. I chose coconut shell buttons with a delicate floral pattern. This cardigan looks gorgeous on. I’d definitely make it again. I thought that it had a French flavour so I made Blossom a little beret in matching colours. She loves wearing her cardigan and beret.